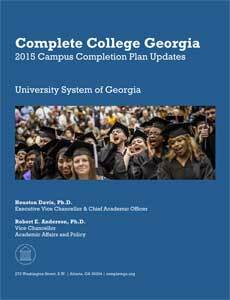 The 2015 Complete College Georgia Campus Plan Updates are now available. Each year, Institutions across the University System of Georgia report on their progress toward meeting the governor's college attainment goals for the state. Georgia’s colleges and universities provide a wide range of programs to meet the state’s diverse needs. The report for each institution highlights the diversity of opportunity and informed approach that continues to mark Georgia as a national leader in supporting students as they work toward their college aspirations. As illustrated in the report, the institutions of the University System of Georgia in partnership with the Technical College System of Georgia, the Georgia Department of Education, and the state's private colleges and universities, are addressing the needs of Georgia's citizens and businesses to be competitive and strong. The report is available for downloading here. Links to individual campus plans are can be found here. Download the guidelines as a PDF. In 2012, each of Georgia’s public institutions submitted campus plans detailing strategies to increase access and graduation in support of the goals of Complete College Georgia (CCG) to the governor. These campus plans are updated annually with the submission of a status report. For 2015, we are maintaining last year’s approach to streamlining and focusing the status report process by aligning data and measures with your institution’s strategies and ultimately to the goals of Complete College Georgia. This year’s report does not vary significantly from the structure of last years report, except for simplifying and clarifying the narrative report discussion of goals, strategies and activities (which have been combined into one element), and asking for greater specificity on milestones and goals. The status report provides an opportunity to reflect on the progress your institution have made in the past year and readjust and refine your institution’s goals. It is also a valuable tool that helps the System Office to understand common areas of strength and to highlight how and where to support institutions in achieving their goals. The report is most importantly a vehicle to communicate our progress and status with key stakeholders. The 2015 status updates has two sections: A survey and strategy guide for institutions to indicate the goals and strategies that they have adopted and a narrative section for more detailed discussion of the work and progress of the past year. Together these elements will help to paint a comprehensive picture of the varied and productive work in place on our campuses. Also continuing from last year, each institution has a dedicated completion plan liaison who can be your first point of contact for questions related to your update. A list of staff liaisons is at the end of these guidelines. The Campus Plan Strategy Survey is a brief, online tool for you to register which goals you have adopted and which strategies you are pursuing to meet those goals. Collecting this information will provide a valuable overview of activities across the University System. The survey asks you to identify which of the eight identified CCG goals you are working on and provides an opportunity for you to highlight other goals as well. For each of the CCG goals, you will be asked to identify the specific strategies you have adopted, and to supply information on practices you have implemented (indicated on the survey as process metrics).You may pause, save and exit the survey and return to complete it. Additionally, if you complete the survey and need to provide additional information, you may submit additional responses as needed. Upon completion, you will be able to review your survey and, upon submission, you will see a list of recommended metrics for measuring your progress. Please take a moment to review this page, since these metrics will guide your work in future years. An online preview of the survey is available as well to provide you with an overview of the included items; surveys should be completed online. Please refer to the online CCG Goals and Strategies Overview and the Goals Strategies and Metrics Guide for more information on strategies aligned to specific CCG Goals. A more compreensive review ogoals, strategies and metrics is also available. The 2015 status report features three areas of focus that will be reported to the governor: an institutional profile; institutional goals, strategies and activities; and general observations. The narrative overview is your opportunity to review in fuller detail the work that you have engaged in at your campus in achieving your Complete College Georgia Goals. The three sections of the narrative overview will capture your institution and it’s work as well as provide a high-level summary of your significant activities in the past year. Before completing your narrative section, it is recommended that you review the Goals, Strategies and Metrics Guide to help you structure your response in terms of goals, strategies and measures of progress and success. Provide a brief overview of your institutional mission and student body profile. Please briefly describe how your enrollment trends, demographics (for example, % Pell grant-eligible, % first-generation college students, % adult learners), and institutional mission influence your completion work’s key priorities. Based on your review of data on completion indicators, your institutional mission, and the resources available, please identify no more than five high-impact strategies (and its associated goal) for your institution’s students. The strategies and goals you select to highlight should emerge from Part I: Campus Plan Strategy Guide And Metric Survey. What Completion Goals you are highlighting? How would meeting these goals significantly increase completion for your students? What specific strategies are you pursuing? What activities have you undertaken in the past year for this strategy? What is the current status of the measure(s) you are using to measure your progress and/or success? What are the specific interim measures of progress (milestones) you have for this activity? What are the measures of success (goals) you have set for this activity? Please provide specific, measurable goals for interim measures of progress and success. What needs or challenges to achieving these completion goals that have been identified? What steps or programs has your campus taken to address the identified challenges? Along with a general description of each strategy, provide details on any outside partnerships, required resources, and identification of those involved (e.g., staff/faculty and number of students). For convenience, please follow the sample matrix provided for each strategy. Which completion goal does this strategy address? What progress have you made towards implementing this strategy? What specific activities did you engage in this year in regards to this strategy? What metric(s) is your institution using to assess the outcome of this strategy? If there are additional high-impact strategies that your institution will pursue or is interested in pursuing in the near future, please briefly describe those strategies. What strategies and activities have been most successful? What have been least effective? Has your institution made adjustments completion activities over the past three years. If so, please explain why? Campus Plan Strategy Surveys can be completed online. Narrative reports may be submitted here as a Microsoft Word file. Files not submitted through the CCG website should be sent via email to CCG@usg.edu. Questions on your update can be directed to your institution USG-CCG liaison (see below), or to Jonathan Watts Hull at jonathan.hull@usg.edu, 404-962-3129.